Protesters take to the stage at Roundhouse over BP Olympics sponsorship – BP or not BP? Posted on June 28, 2012 by BP or not BP? For more information, interviews, photographs and film footage contact Jess Worth on: info@bp-or-not-bp.org or 07807 095669. Photographs are also available from David Hoffman on: david@hoffmanphotos.com. For information on copyright and credits, see . Last night (27th June 2012), to mark one month before the Olympics opening ceremony, a group of merry players known as the “Reclaim Shakespeare Company” took unexpectedly to the stage at the Roundhouse Theatre in Camden. Five minutes before a BP-sponsored Royal Shakespeare Company (RSC) performance of The Comedy of Errors was due to begin, the actors performed a short Shakespeare-inspired piece. They challenged the RSC and the London Olympics over their decision to accept sponsorship from BP in the wake of the Deepwater Horizon drilling disaster  and the company’s decision to start extracting highly polluting and destructive tar sands oil in Canada . The surprise performance coincided with a theatre outing for BP employees, which meant that a significant portion of the audience was made up of BP staff, making the pop-up protest especially embarrassing for the RSC. 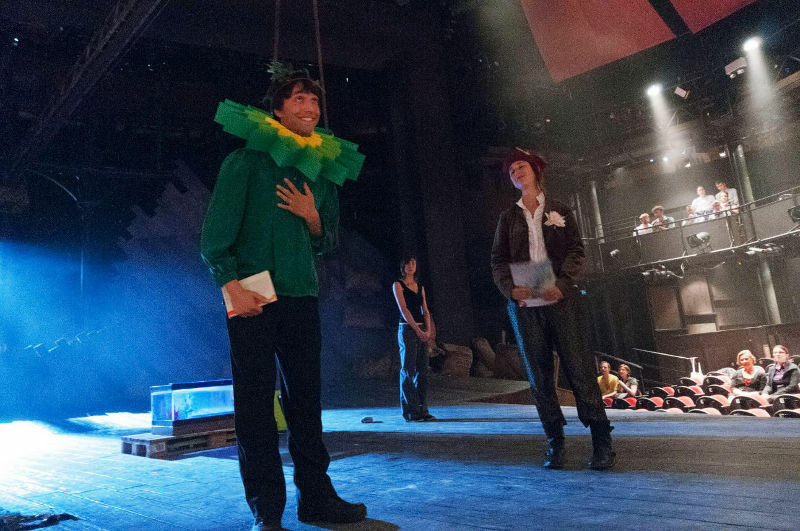 This was the third such intervention by the Reclaim Shakespeare Company, the first two having taken place on the Royal Shakespeare Theatre stage in Stratford-upon-Avon. It came a week after Mark Rylance, one of the UK’s leading actors, who is performing in the Olympic opening ceremony, expressed his concerns about BP’s sponsorship of the Olympics and the Cultural Olympiad (of which the World Shakespeare Festival is part) on Radio 4’s Today Programme. The three actor-vists performed a three-minute sketch inspired by The Comedy of Errors, in which the narrator first meets a ‘fine and worthy’ patron of the arts, and then meets a ‘noxious, treach’rous, belching, oily rogue’ – who turn out to both be the same character, BP (sporting an impressive BP logo as a ruff). On discovering this, BP is accused of ‘taking fair nature as his green-tinged guise’ whilst ‘with daring folly [he] burns the world.’ The performance culminated with a call to action: ‘Enough! No more! / Now is the summer of our discontent. / Out, damn logo!’, with the narrator ripping the BP logo from her theatre programme. The audience were then encouraged to do the same. The full script can be seen below. Although a member of staff got up on stage near the start to ask them to stop, the performers reassured him and continued to the end. The performance was greeted with laughter and applause by the audience. After the performance, a member of the Royal Shakespeare Company – Jonathan Slinger – addressed the audience, saying that the RSC has a policy of “allowing these peaceful protests to go ahead”. 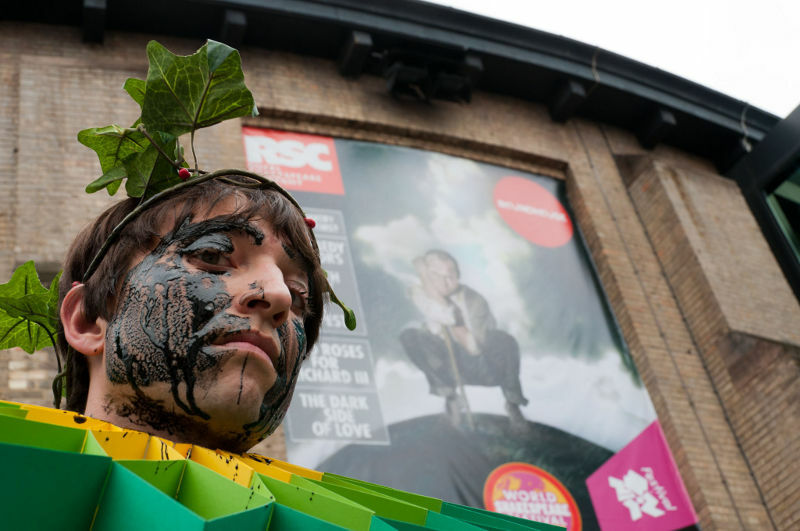 BP’s sponsorship of the World Shakespeare Festival and the “What country friends is this?” trilogy of plays by the RSC  is part of a massive sponsorship deal for the Olympics, which also includes being Oil & Gas Partner and Sustainability Partner to the Games themselves. This sponsorship has already triggered a wave of criticism, including a hijacking of the Olympics website that persuaded some media outlets that BP had been dropped as Sustainability Partner , the launch of the “Greenwash Gold” awards for worst Olympics sponsor, which offer the public the choice to vote for BP, Dow Chemical and Rio Tinto , and an Early Day Motion in Parliament, which is being signed by MPs. Attached photos are subject to the following: These photographs are copyright but may be reproduced with credit “David Hoffman” without specific permission or payment ONLY IN the context of the work of the Reclaim Shakespeare Company AND only until the end of 2012. Moral rights asserted under Copyright Designs & Patents Act 1988. The full script can be found at the end of these notes. See http://www.bplondon2012.com/ for more info. Ladies and gentlemen, there now follows a two minute performance by the Reclaim Shakespeare Company, about BP’s sponsorship of tonight’s play. It was here I did encounter two wyrd brothers. A merry music whistling through his lips. Forever in the company of players. And tending to the earth. There’s not a man I meet but doth salute me! A fine, and worthy man, thought I, as he skipped on his way. His body dark with tar and bleeding oil. Begone, thou swaggering rascal! did I cry. Thou spakest with me but a moment hence. I am as black as hell, as dark as night. In but one single body? Am I mad? Did black the green garb of the fragrant bard. Taking fair nature as his green-tinged guise! Who with his daring folly, burns the world. Now is the summer of our discontent! This has been a performance by the Reclaim Shakespeare Company. 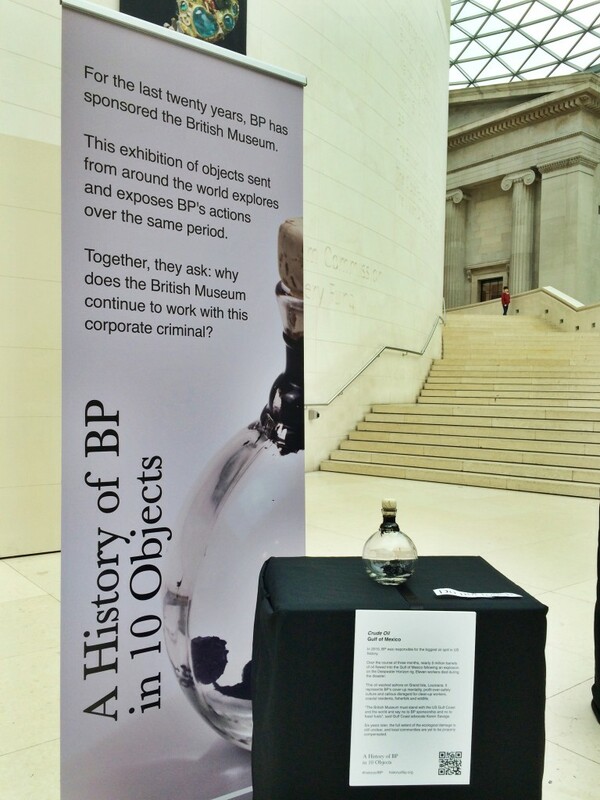 If you share our concerns about BP’s sponsorship of the arts, please join us in ripping the logo from your programme. We hope you enjoy Comedy of Errors. Canst those involved with RSC and World Shakespeare Festival speak out? I hope other similar events go well for you? and perhaps there will be a change to organisations policies on how & who they accept money from?